I’ve written about the LCD card from Yellow Owl Workshop before but I had to mention their stamps. There are some nice scenic stamp sets which would be great for kids but there’s lots of grown-up stamps too, I’m particularly hankering after the ones in their stamp activity kits section. 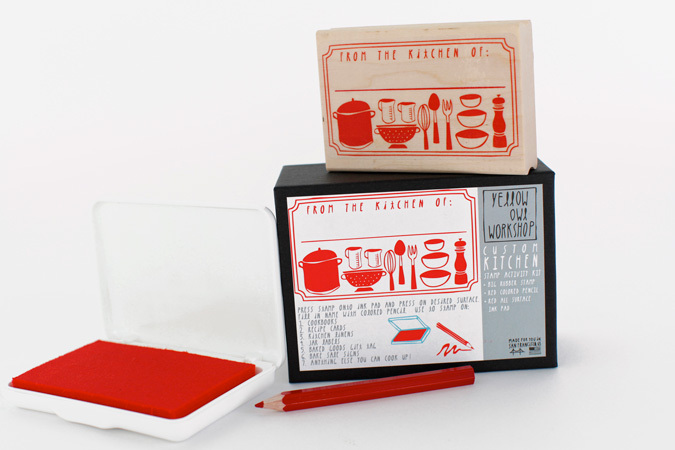 Make sure you take all the credit for your culinary creations and label your food gifts with this lovely red ‘From the kitchen of…’ stamp set. 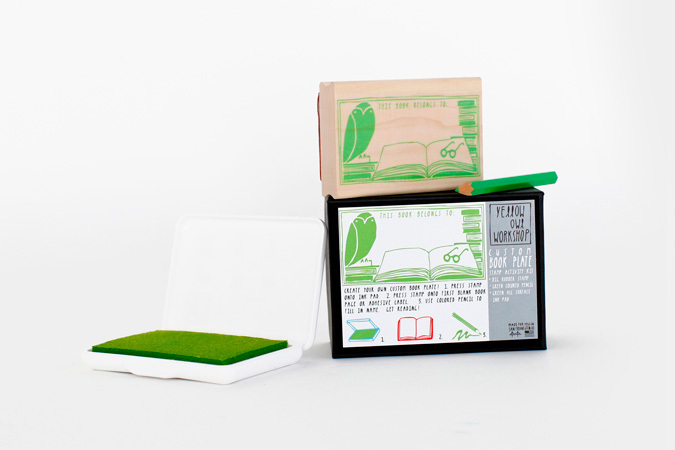 If you like to share a good book but also like to get them back, stamp your books with this bright green stamp. That owl will give any greedy book borrowers a stern look. Or stamp your own place cards, gift tags or noughts and crosses game. These are all $19.50 and include a natural rubber stamp mounted on a maple block, ink pad and coordinating coloured pencil. 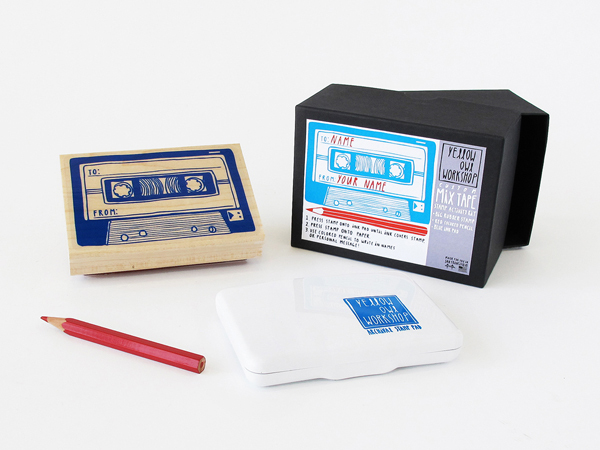 I may have to explain the mix-tape gift tag to my younger gift recipients but I’m really hankering after this one. Yellow Owl also have some cute place stamp sets. London features stamps of Big Ben and a double-decker bus, and just look at the Paris one below with the Eiffel Tower and café table and chairs. There are also sets for New York, San Francisco and Italy. If you want to have a go at carving your own stamp Yellow Owl Workshop sell a kit to help you do just that. 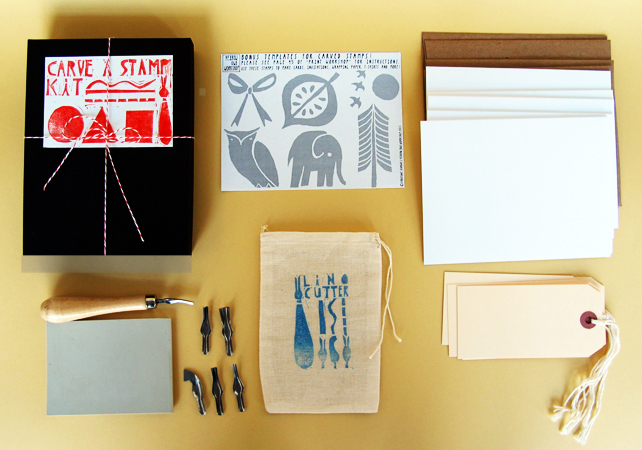 It comes with a Print Workshop book autographed by the author Christine Schmidt, a lino cutter and blade set, rubber block to carve your stamp from and an array of envelopes, cards and gift tags for you to show off your stamp creations. If you’re not confident carving freehand there are some templates included to help you. All this for $40 which I think is pretty good. What stamp would you create?